So what is astigmatism? Is it something that you need to worry about? We’ve collected some basic information here to help set your mind at ease. Simply put, astigmatism is caused by an imperfection in the cornea. In a normal eye, the cornea (the front surface of the eye) is curved evenly on both sides. When one side is curved slightly more or less than the other, this causes astigmatism. This is actually one of the most common diagnosis, affecting as many as 1 in 3 individuals. There are varying degrees though, and many people with minor astigmatisms don’t require the use of any sort of corrective lenses. When most people go to the optometrist, it is because they are having trouble seeing things either close to their eyes, or far away. With astigmatism, the blurred vision often occurs at all distances. It is also usually accompanied by eye strain and moderate to severe headaches. Why does an astigmatism develop? There is no exact answer to this question. They can be present from birth, or develop later in life. There are some studies that suggest it could be genetic, but there are no conclusive answers as of yet. However, statistics also show that premature babies and people born with a low birth weight have a higher percentage of developing astigmatism due their cornea not curving properly from birth. Vision tests — Everyone is familiar with these. You read a chart of letters (or symbols for young children) from across the room. Keratometer — This device is designed to measure light reflection from the cornea. This allows the optician to determine the curvature of the cornea and definitively see whether or not astigmatism is present. In most cases, the use of prescription lenses is the only treatment that is need for astigmatism. Specsand contact lenses can both be used for this purpose. 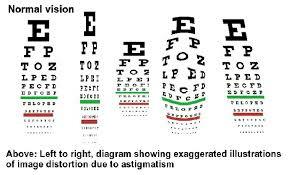 If your optometrist hands you a prescription with a correction for atigmatism, don’t worry! Not only is it one of the most common diagnoses, it is easy and painless to treat. Silhouette has revolutionised the world of eyewear with the world's lightest glasses. Extremely high standards of workmanship and the use of the latest materials and production techniques has enabled Silhouette to create new and innovative products and Silhouette is now availble here at ideal eyewear.